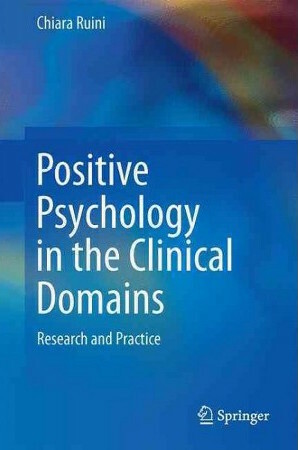 This book builds the bridge between the fields of clinical and positive psychology research and practice. It presents a variety of interventions aimed at promoting positivity in clinical populations. Although clinical psychology has addressed issues such as happiness, resilience and optimal functioning, the field has stuck to the medical model and paid more attention to distress and negativity in human existence. Positive psychology, on the other hand, has been considered a â€œpsychology for allâ€ and has devoted attention and resources to the investigation of positivity in general populations, Only recently, the relationships between positivity, distress and psychopathology have been investigated. This book integrates research and practice from both fields. Its first part provides a theoretical framework for describing concepts such as hedonic and eudaimonic wellbeing, resilience, characterâ€™s strengths, positive health and positive functioning, with a special reference to their clinical implications and their psychosomatic underpinnings. The second part provides a review of positive interventions in clinical practice and psychotherapeutic settings. These interventions are derived from positive psychology as well as from longstanding traditions in clinical psychology and psychiatry, and from eastern clinical and philosophical approaches.